Family drama • Vernal senator pushing for stricter treatment of plural marriage says his daughter was hurt by her husband, who has a second wife. Chris Detrick | The Salt Lake Tribune Nick Henderson looks at the Senate calendar during Senate Floor Time at the Utah State Capitol Thursday March 9, 2017. 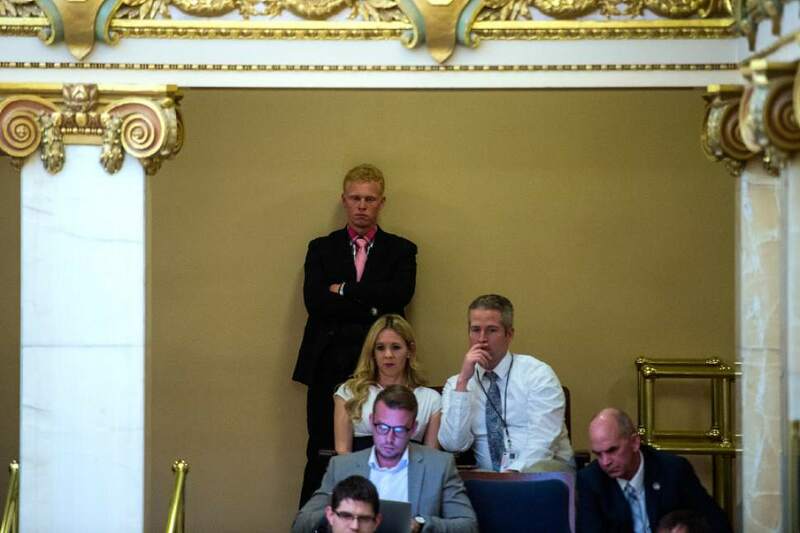 Chris Detrick | The Salt Lake Tribune Kyler Henderson, Kayla Henderson and Lance Henderson listen during Senate Floor Time at the Utah State Capitol Thursday March 9, 2017. Chris Detrick | The Salt Lake Tribune Nick Henderson looks at the Senate calendar during Senate Floor Time at the Utah State Capitol Thursday March 9, 2017. Francisco Kjolseth | The Salt Lake Tribune Kayla Henderson, granddaughter of Sen. Kevin VanTassell, R-Vernal, writes notes in opposition to HB99, the bigamy bill at the Utah Capitol during the last night of the legislative session, Thursday, March 9, 2017. Sen. Van Tassell's grandchildren from his daughter who has been in the Apostolic United Brethrens were at the Capitol to refute what Van Tassell said about their father. Francisco Kjolseth | The Salt Lake Tribune Kayla Henderson and her brother Nick, grandkids of Sen. Kevin VanTassell, R-Vernal, write notes in opposition to HB99, the bigamy bill at the Utah Capitol during the last night of the legislative session, Thursday, March 9, 2017. Sen. Van Tassell's grandchildren from his daughter who has been in the Apostolic United Brethrens were at the Capitol to refute what Van Tassell said about their father. Chris Detrick | The Salt Lake Tribune Senator Kevin T. Van Tassell listens during Senate Floor Time at the Utah State Capitol Thursday March 9, 2017. 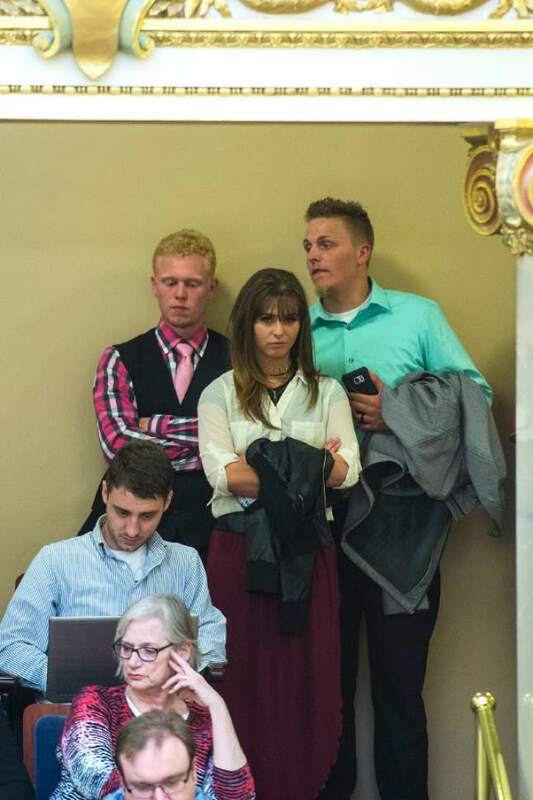 Chris Detrick | The Salt Lake Tribune Kyler Henderson, Kayla Henderson, Lance Henderson and Nick Henderson listen during Senate Floor Time at the Utah State Capitol Thursday March 9, 2017. Chris Detrick | The Salt Lake Tribune Kyler Henderson listens during Senate Floor Time at the Utah State Capitol Thursday March 9, 2017. 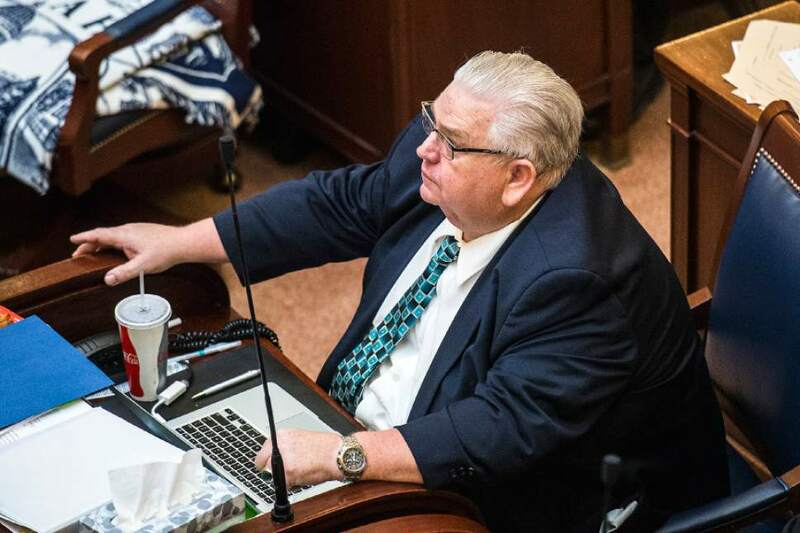 A Utah state senator sponsoring a bill changing the definition of bigamy and increasing the penalties in some cases tried to secure votes Thursday by showing colleagues photos of bruises he says his daughter suffered at the hands of her husband  who has a second wife. 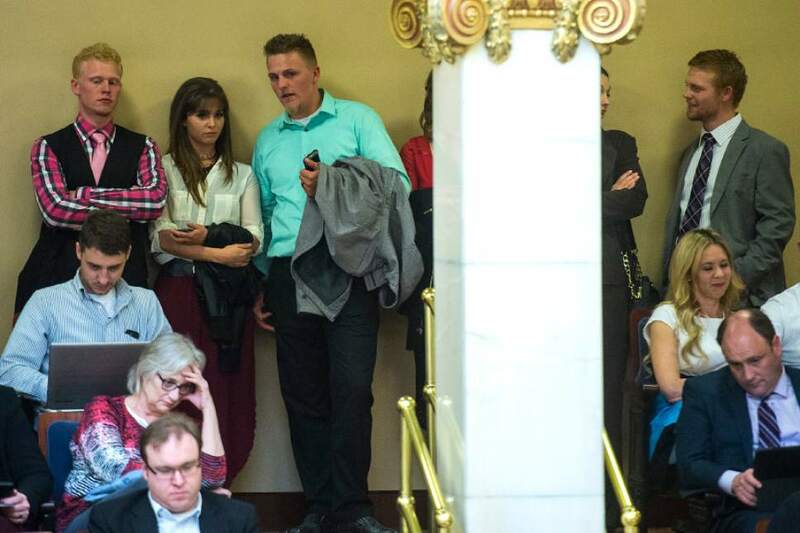 Sen. Kevin Van Tassell&apos;s efforts to use his daughter, who sat next to him on the Senate floor for part of Thursday, to push passage of the measure spurred an only-in-Utah political and family drama in the final hours of the Legislature&apos;s general session, according to interviews. Van Tassell&apos;s own grandchildren went to the Capitol to rebut the allegations against their father and to oppose the bill. "It was a very personal and kind of awkward situation," Sen. Todd Weiler, R-Woods Cross, said Friday. The grandchildren&apos;s lobbying didn&apos;t work. HB99 passed 15-14, with five minutes to spare in the session. It will be up to Gov. Gary Herbert on whether it becomes law. Herbert&apos;s spokeswoman, Kirsten Rappleye, said in an email Friday that the governor still needs to review the bill and no determination has been made. Van Tassell did not return messages seeking comment Friday. Court records show his 42-year-old daughter, Nicole Lee Henderson, is in the midst of divorcing Kyle Henderson. He is age 49 or 50. Court records list two birthdates. One ruling from a judge made reference to the marriage being "polygamous." It has been a contentious divorce. There have been competing claims of abuse and neglect involving the couple&apos;s 13 children, records show. At least seven of those children are minors. 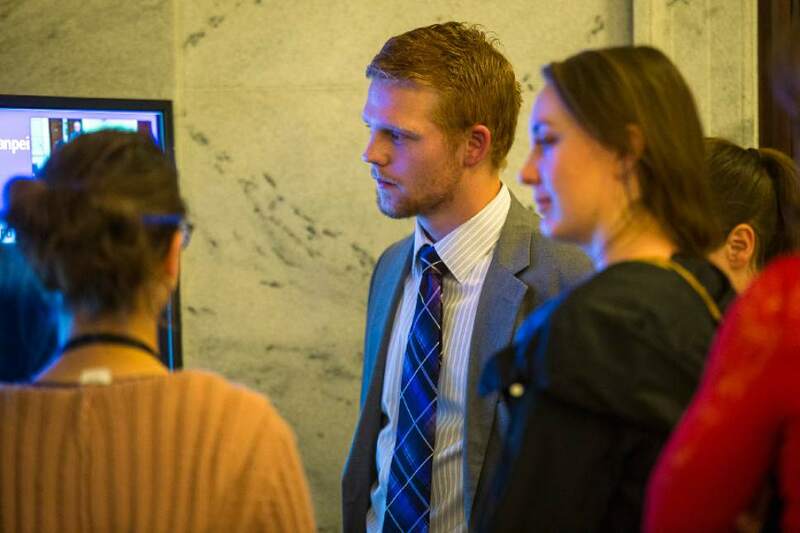 Kyle Henderson has pleaded not guilty in Provo&apos;s 4th District Court to two third-degree felony counts of assault involving domestic violence as well as a third-degree felony count of witness tampering and two other misdemeanors, for alleged attacks on his wife. Each of the felonies carry up to five years in prison. A trial has not yet been scheduled. He pleaded guilty in November in 3rd District Court in West Jordan to a misdemeanor count of violating a protective order and was sentenced to probation. Lehi police on Feb. 8 cited Nicole Henderson with a misdemeanor count of driving under the influence. She has not yet entered a plea in 4th District Court. The charging document says someone "under the age of 18" was a passenger in the vehicle at the time of the offense. Nicole Henderson&apos;s attorney, Roger Hoole, said Friday that a breath test conducted by Lehi police showed his client had a blood-alcohol level of 0.066. That&apos;s below the legal limit of 0.08. Hoole expects the charge to be dismissed. The Hendersons have belonged to the Apostolic United Brethren (AUB). It is based in Bluffdale; and polygamy is one of its tenets. Hoole said Nicole and Kyle Henderson were married for 25 years. They met while Kyle Henderson was working as an excavator on a new high school in the Uinta Basin. Then-Nicole Van Tassell was still a high school student. "She was a young kid," Hoole said, "and he had a Mustang convertible, and she married him within one month of graduating. Her parents were not enthusiastic." Kevin Van Tassell is a member of The Church of Jesus Christ of Latter-day Saints, which officially abandoned the practice of polygamy in 1890. Members caught practicing polygamy are excommunicated. Kyle Henderson entered into a spiritual marriage with a second woman in 2012, Hoole said. The records from Kyle Henderson&apos;s criminal case suggest it was jealousy that sparked what prosecutors allege were assaults against Nicole Henderson. On April 10, 2016, the husband believed Nicole Henderson was communicating with another man "and attacked her," according to a probable cause statement. About six weeks later, Kyle Henderson threw a beer can at Nicole Henderson and caused a hairline fracture of her arm, the statement says. On July 5, she spoke to a neighbor without his permission and he kicked her, that statement also says. Nicole Henderson filed for divorce July 18. Hoole said the adult Henderson children are rebutting her allegations of abuse because their father is exerting control over them. That&apos;s part of what Hoole describes as a patriarchal "cycle" that his client is trying to break. Hoole doesn&apos;t know the extent to which Van Tassell&apos;s support of HB99 was influenced by his daughter. "I think she would prefer that she not be in a position where she has to have her story told or tell her story," Hoole said. "She would prefer none of this ever happened, but she&apos;s a pretty strong person." HB99 adds criteria for being prosecuted for bigamy: The offender would have to live with the extra spouse and "purport" to be married. Current state law requires only one or the other. Bigamy would remain punishable by up to five years in prison, but the penalties could increase to 15 years if the offender is convicted in concert with crimes such as fraud, abuse or human smuggling. Anyone leaving a polygamous marriage and saying they suffered abuse or seeking to protect children would receive amnesty. 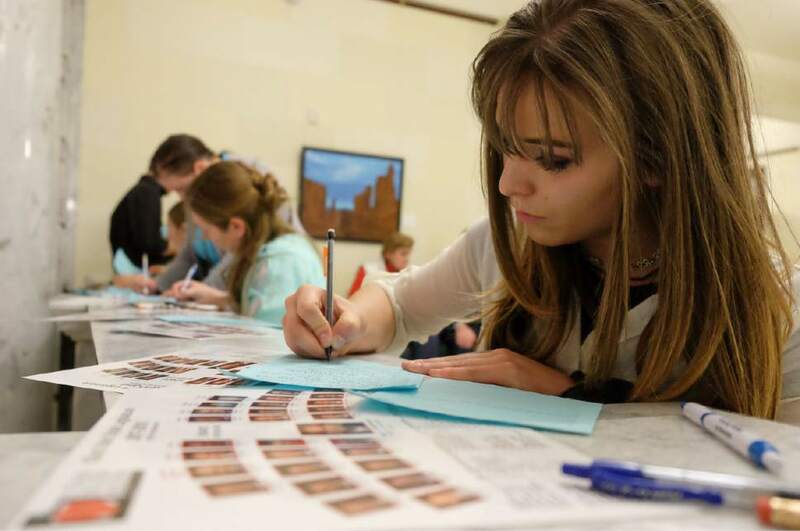 Bill backers, including Utah Attorney General Sean Reyes and some former plural wives, have said the legislation would encourage pursuit of polygamous groups that commit fraud and abuse. Polygamists and some civil libertarians who have sided with them have argued that the state already has laws targeting those crimes, and that the bill would further criminalize relationships that would be legal if the parties didn&apos;t "purport" to be married. Marianne Watson, AUB council, is among those who don&apos;t believe the abuse allegations against Kyle Henderson, who is a bishop in the AUB. Watson said she emailed Van Tassell to argue against HB99. "We don&apos;t want abuse," Watson said, "but we don&apos;t want to be abused either." Watson said Nicole Henderson kept to herself more than other women in the AUB. Most members knew her father was a state senator, but they didn&apos;t know his name. Four of the Henderson adult children went to the Capitol on Thursday to rebut the abuse assertions. Weiler said Van Tassell was showing other senators photos purporting to show the abuse his daughter suffered. Later, Weiler said, the Henderson children were sending notes to senators on the floor stating their grandfather was spreading lies about their lifestyle. "The oddest thing in all of my six sessions is [Van Tassell] had grandchildren there lobbying against the bill," Weiler said Friday. Weiler did not appreciate the allegations the Hendersons were making against Van Tasell, and was tempted to vote for HB99 because of it, he said. Weiler ultimately voted against the measure for fear it would only drive polygamy further underground  a concern polygamists have voiced. But Weiler defended any charge that Van Tassell shouldn&apos;t have pushed a measure so close to his own family. 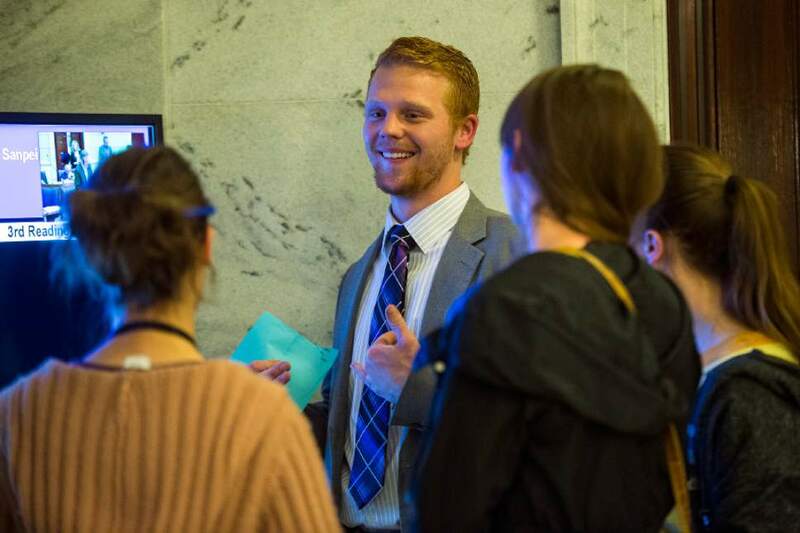 It&apos;s common for Utah&apos;s part-time legislators, he said, to advocate on issues they know about. "He handled it like a champ," Weiler said. "He let us know that this was not just another bill for him, that this was a very painful chapter in his family&apos;s life. That made it very real."